Grilling watermelon makes it warm and caramelized on the outside while leaving it refreshing and crunchy on the inside. Chef Brian Moyers serves this all summer at BLT Steak in Los Angeles. Try it once, and you’ll be serving it all summer at backyard cookouts. Lightly season both color watermelon (one of each color per person) with olive oil, salt and pepper. Grill the watermelon for 30 second then flip and grill other side for 30 seconds until you get nice grill marks but the watermelon will not be to hot in the center. Set to the side while quickly preparing the salad. In a mixing bowl combine (per person) a handful of arugula, a couple pieces of spring onion, a squeeze of lemon juice and a splash of olive oil, salt and pepper. 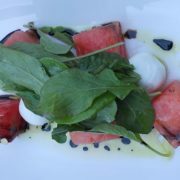 For each salad cut each watermelon into three square pieces and alternate them on a plate with the goat cheese balls. Place the dressed arugula salad in the center of each plate. 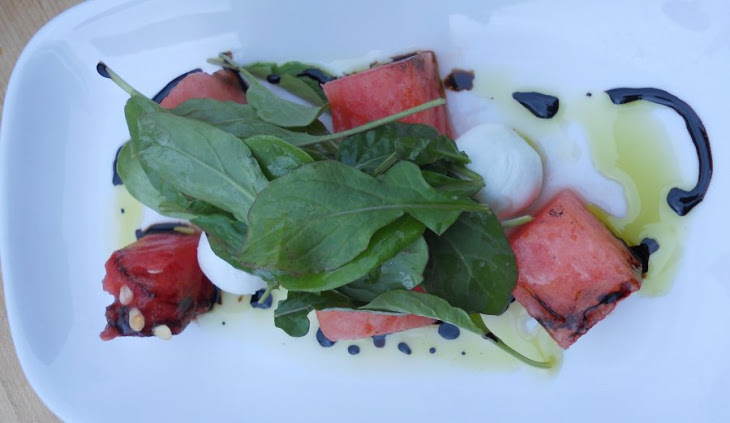 Drizzle the basil oil & balsamic reduction over the watermelon and goat cheese.